Vitamins A and C are essential for the maintenance of a healthy, youthful skin. Our active vitamins work their best when they reach the desired depth of your skin. The Ionzyme DF Machine represents a cutting edge process in enhancing the penetration of vitamins into the skin. At the forefront of scientific skincare, this treatment is possibly the most effective available in the world today. 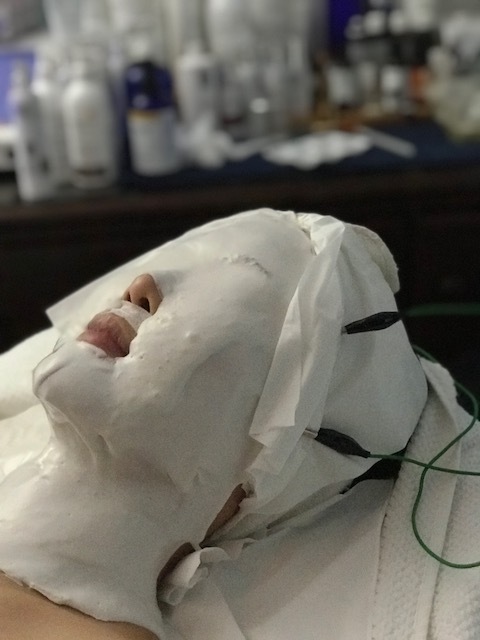 -Involves the use of a specifically pulsed electrical current to facilitate greater penetration of water-soluble vitamins and other active molecules into the skin. -Involves the use of sound waves to transport all molecules and large peptides through the skin. This method is up to 1000 times more effective than conventional ultrasound. Environ is the pioneer in both the use of Low Frequency Sonophoresis and its combination with Pulsed Ionophoresis within one treatment. To increase hyaluronic acid levels in the skin. The Ionzyme DF II Machine was designed to enhance the penetration of many different molecules, over and above vitamins. In other cases the focused enhancement of penetration of selected active molecules can relax frown muscles and smoothen fine wrinkles for people who do not use vitamin A and C, by boosting hyaluronic acid levels in the skin. Your treatments should be scheduled once or twice per week for an optimal period of 24 treatments, with maintenance visits once a month thereafter. Your trained skincare therapist will assess your unique needs and carefully advise a treatment plan for you.